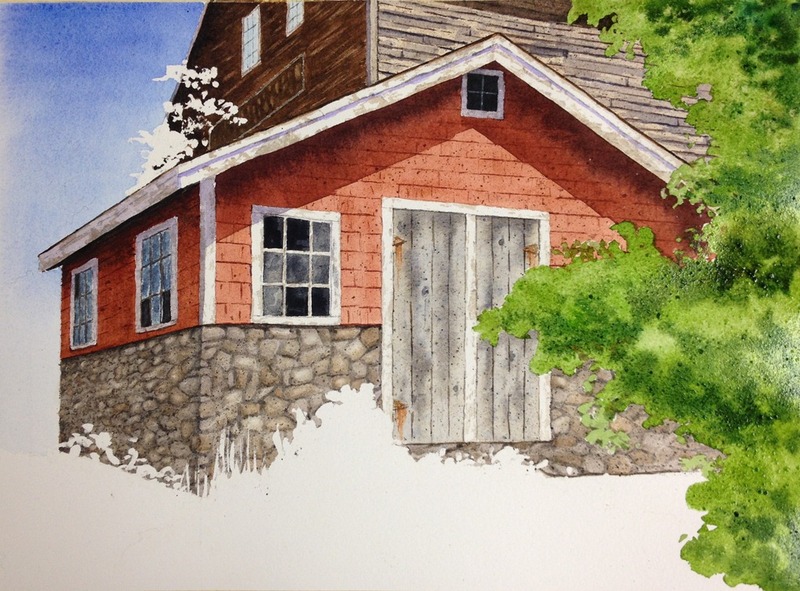 I recently took a watercolor workshop from Amesbury (Massachusetts) watercolor artist Joan Gessner during a 4-month leave of absence from work. 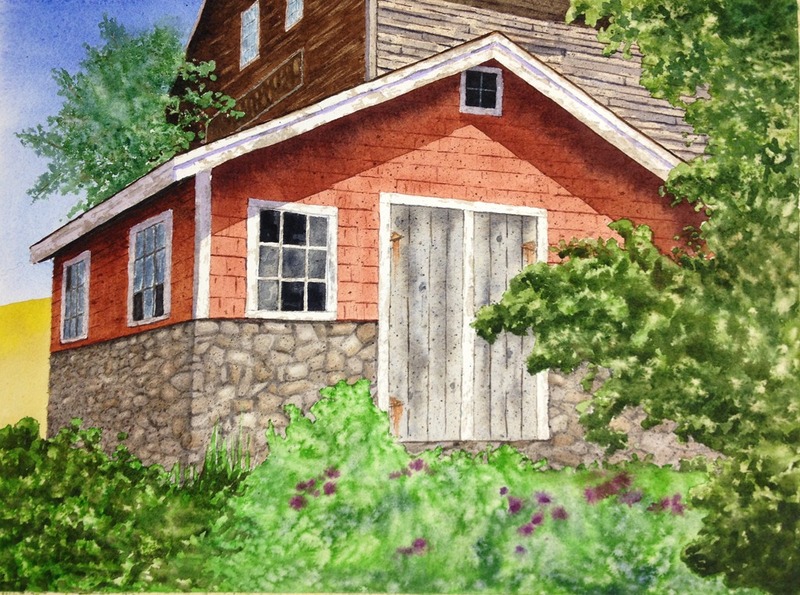 Joan is a highly technical artist, and her instruction focuses on technique. I thought this focus on the process would be good for me (and help me overcome my tendency to fixate on the outcome). I’ve always been enchanted by stonework, and I’m drawn into paintings where the artist has been able to capture a rock or stone wall. I thought this would be a great opportunity for me to learn how to paint stones. Each class was 2 hours, and over the course of 6 classes (and some work-at-home), a painting emerged that I never imagined being able to paint. Joan provided guidance each step of the way in terms of helping determine what to do next as well as giving technical pointers and tricks of the trade. Unlike some instructors I’ve had, Joan was very respectful when she needed to demonstrate a technique, always asking if she could enter my painting. I had an instructor who would take my brush without asking and paint in my painting until I asked her for the brush back. Joan would demonstrate a technique by painting a very small part and then turning the brush back to me. Often she would demonstrate on a scrap piece of paper. If you’re interested in the blow-by-blow account, read on! If not, you can just scroll through the pictures to see how the painting developed. 1. Sketched the photograph using T-square and triangle to get the angles right. Applied masking fluid to preserve white areas, including the foliage lines (first coated the brush with soap so the masking fluid wouldn’t ruin the brush). Taped the photograph to my painting board (not shown in the image) so that I could transfer angles to the painting easily. Joan is a firm believer that if you don’t get the perspective and lines just right in the sketch, then your whole painting will be on shaky ground (so to speak). 2. Applied background washes. Drew in stones with pencil (looked at the photograph often to get the feel of the stone shapes). Lifted paint out of the shadow (left) side of the brown barn for clapboard effect. Drew in clapboard lines with pencil on both barn faces (being careful to get the perspective angles right). 3. 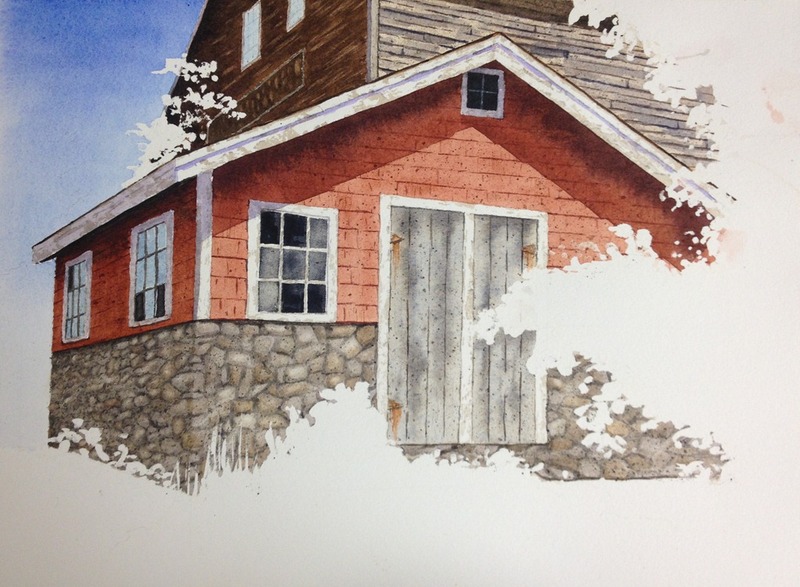 Added detail (clapboard and weathering) to the brown barn walls. Darkened the red barn shadow (left) wall. Started stonework, painting each stone different shades of brown and gray and then adding a shadow color to the underside of each stone. Painted mortar lines between the stones with a mix of ultramarine blue and burnt umber. Painted in clapboard lines on the red barn. 4. Finished the stonework, adding a very light wash of violet for shadow on the left face. Added a background wash to the barn door to create a weathered look (started with a very light wash of burnt umber and ultramarine blue and then dropped in a darker gray (same mix) to the wet wash). 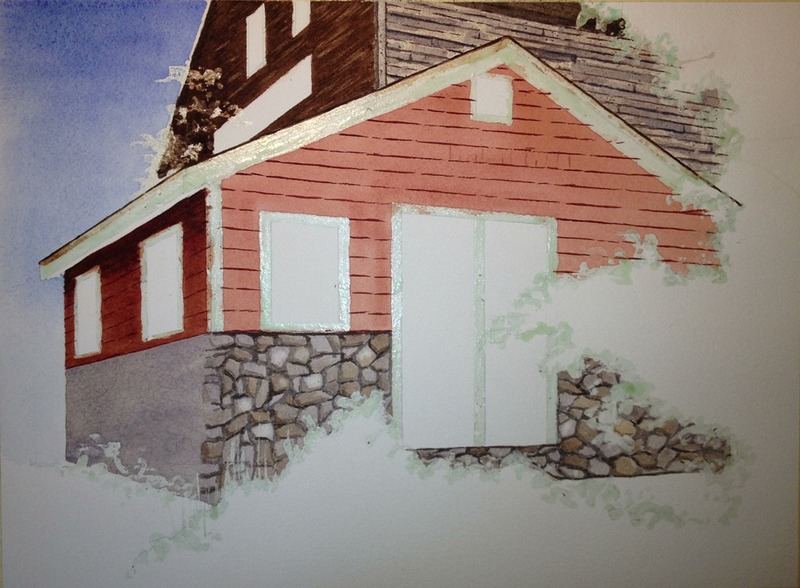 Painted vertical lines on the red barn walls for shingles. 5. Added splatters to all barn surfaces for texture and dimension (used a hard-bristled toothbrush and very intense mix of the same paint color as the surface being splattered). 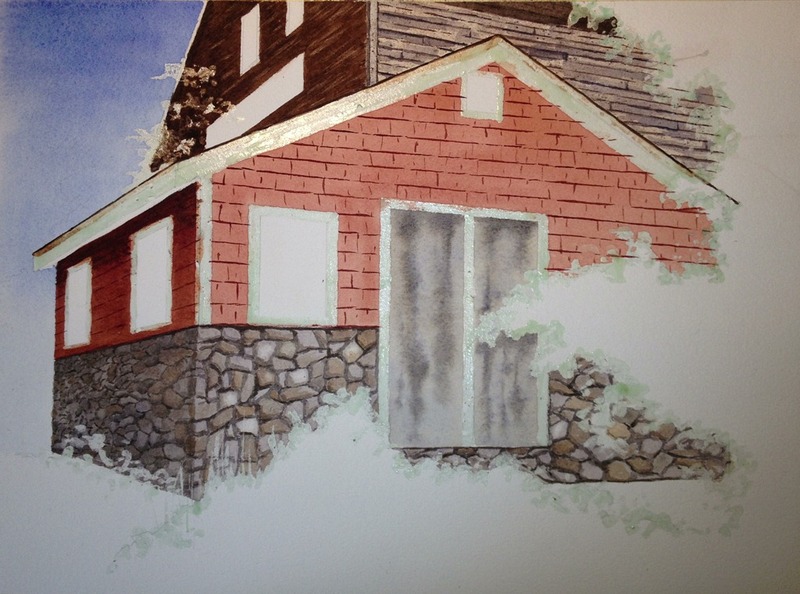 Painted panes of the front window on the red barn, pressing my thumb into the wet paint to give texture. 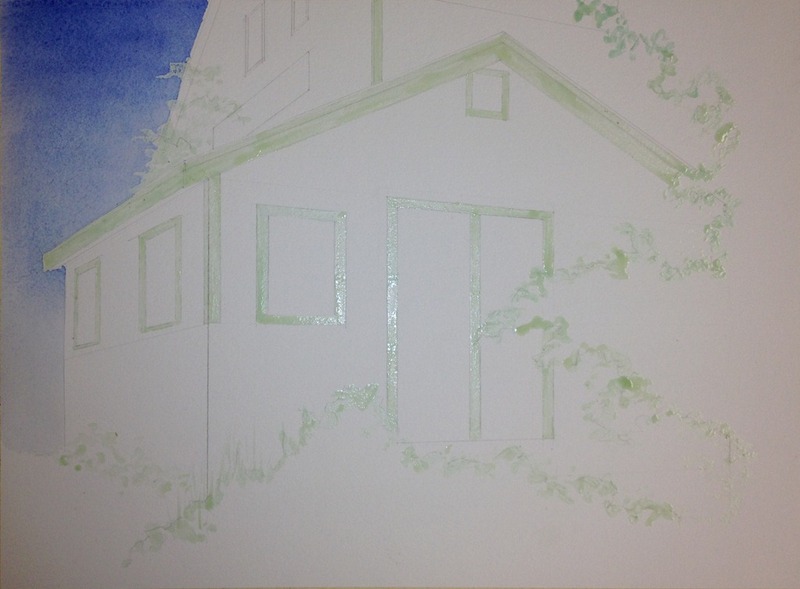 Added cerulean blue to the windows on shadowed sides for reflected sky. 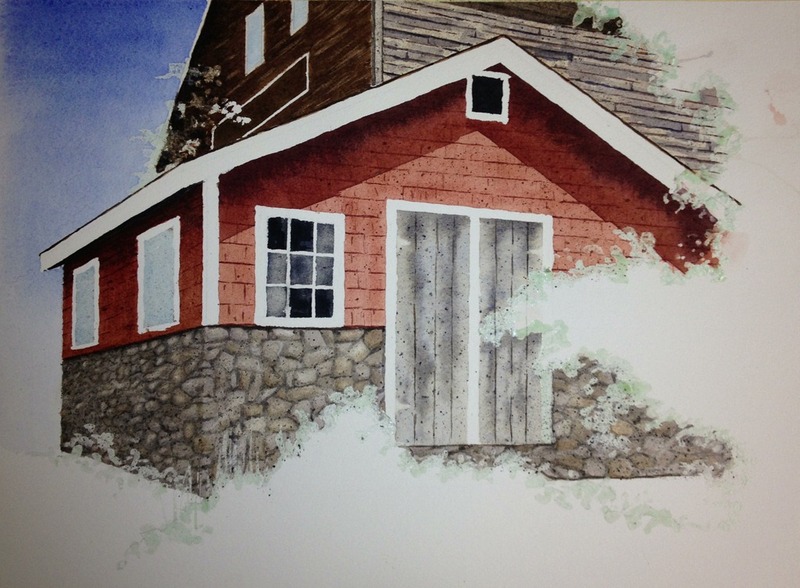 Added a cast shadow under red barn roof. 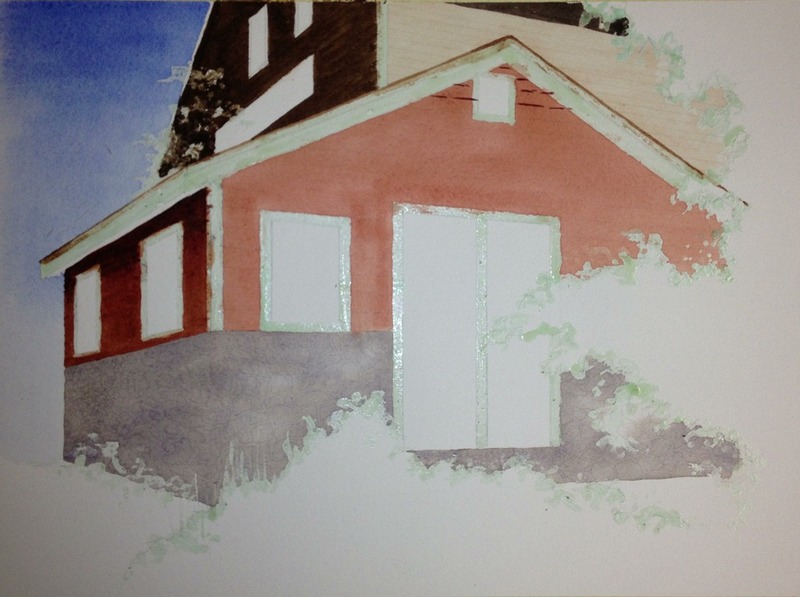 Removed masking fluid from the barn (felt very good to finally see the white!). Lifted some paint out of some of the stones to give them more dimension. 6. Painted panes on the side windows of the red barn. Added burnt sienna for rust on the door hinges (ran a dry brush with burnt sienna down from each hinge to create the rust-stained look on the wood). Removed masking fluid from the foliage edges. Painted peeling paint on all white surfaces of the barn (dry-brushed masking fluid and painted over it with light burnt umber and ultramarine blue mix, leaving white areas when the masking fluid was removed). Lifted paint with a fine brush to create window panes on the window under the peak of the red barn roof. Added slight violet shadow to the roof fascia. 7. Painted foliage on right side with sap green and burnt sienna/sap green mix (for darker green) – first painted a wash of light green, then dropped in dark green to the wet paint (I never would have thought of using burnt sienna to darken the green, but it created a warmer green than using a blue to darken it). Added salt for texturing and spritzed with water for a mottling effect (the image shows the still-wet paint with salt crystals). Added paint to the left windows for more complexity (using the thumb-in-the-wet-paint technique). Added knots to the wooden doors. 8. Painted trees behind/above the barn (spritzed water on the paper and then loosely connected water spots with green paint – a very cool technique). Began foliage in lower left corner. Painted sunlit field in background with mix of yellow ochre and hansa yellow. Notice the foliage on the right side – after the paint dried, the salt crystals and water spritz created the leafy texture of this background layer. 9. Added additional branches to the tree behind the barn to break up the line on the top and the side of the tree (Joan is always looking to break up space and get rid of lines where there should be randomness). Added shadows to define the underside of branches on the right foliage (darker mix of sap green and burnt sienna applied after spritzing the dried background layer). Painted the background for the bottom foliage (using salt and spritz techniques). 10. Added violet flowers to the bottom foliage by putting down water and then dropping in violet paint. 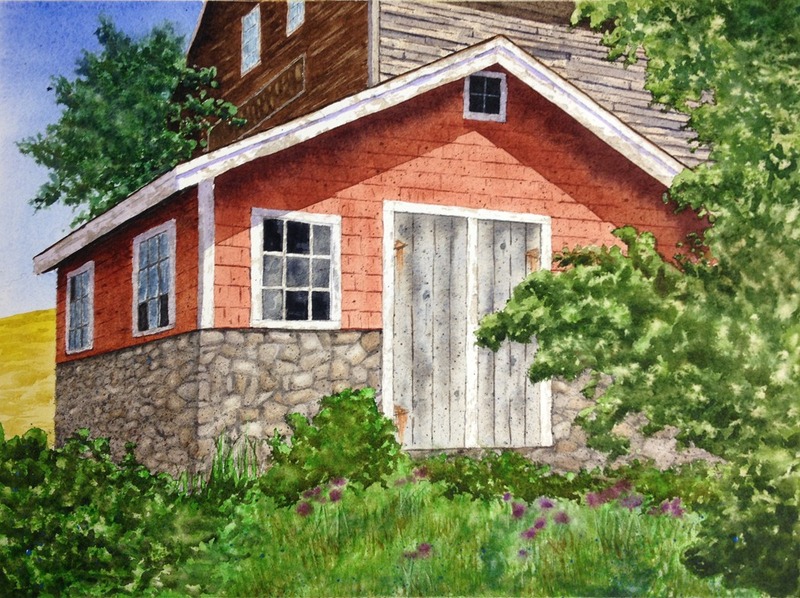 The photograph didn’t have flowers in the foreground, but Joan thought the painting needed something different to break up the foliage in front of the barn – I think they add a lot to the texture and composition of the painting. Added shadows to define the underside of branches in the left foliage. 11. Darkened the foliage behind the flowers to push it into the background. Added grass stems, both lifting paint and adding paint (first a green mix, then a yellow/brown mix). Added texture to the sunlit field in the background with a darker mix of the same yellow ochre/hansa yellow mix. Splattered cerulian blue (!!) 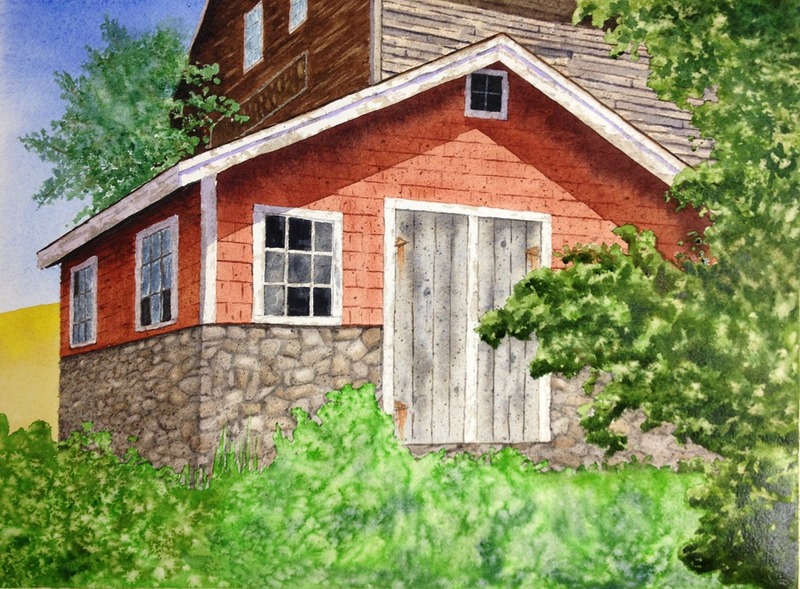 on the shadow side of the barn and the front foliage to add texture and tie into the sky (I never would have thought of that on my own). Added a very dark green mix to the edges of the foliage on the right side to better distinguish the line between barn and foliage. 12. Added my signature to the bottom right corner. Belabored this decision: Initials only? Full name? Upper or lower case? Location? Kind of wish I’d gone with “D. Ronka” closer to the lower edge. (See more on signature angst). Joan Gessner is an incredibly patient and technical teacher. She helped me to think through what each next step should be. I’d like to blog at some point on the differences between the various teachers I’ve had. A painting of this scope takes a LONG time – no wonder original art is so expensive! Foliage normally freaks me out, but the techniques that Joan taught me took the fear out of the foliage – salting, spritzing, mottling, and shadowing the undersides are all now part of my repertoire. You don’t always paint what you see. The sunlit field adds depth to the painting, where the picture only has more foliage in the background. Also, the field with flowers in the foreground breaks up the mass of foliage in the picture. Masking fluid works wonders. But you can’t leave it on too long or you may have trouble getting it off. Splattering is a cool technique for creating dimension and breaking up space, but it can be over-used. Finding the right balance, I’m sure, is the result of ruining a painting or two with over-splattering. There are very few men who take painting workshops in the middle of a weekday morning (thank you for your encouragement and painting camaraderie Lynn, Casey, Arline, Suzanne, and Liz, and thank you Joan!). Stones are cool. But I already knew that. And painting stones is way cool. The step-by-step of drawing the stones, painting the mortar, painting each stone, shadowing the underside, and lifting paint out of the top or center takes the mystery out of stonework. I look forward to putting this technique to use on many rock and stone walls in the future! 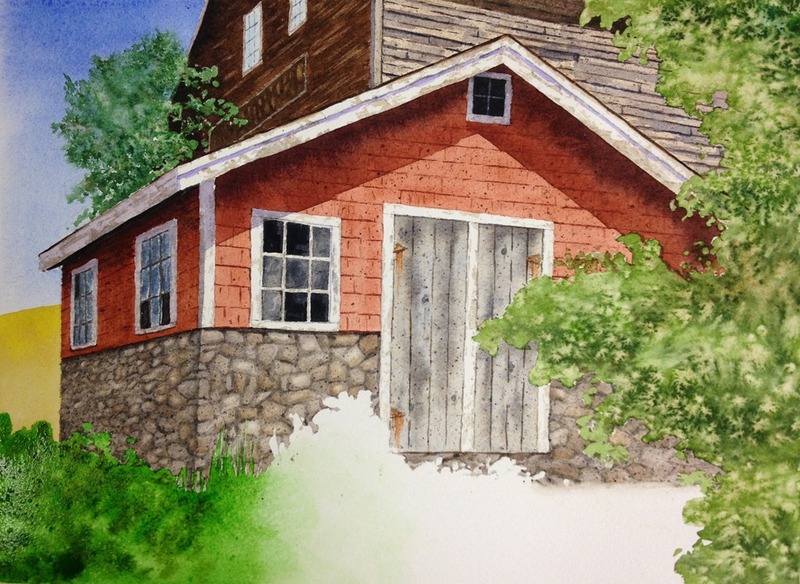 What’s so great about watercolor is the myriad of approaches and techniques. Sometimes you stumble on a great technique, and sometimes you pick it up from a fellow painter. I’m grateful for all of the artists who are willing to pass on what they’ve learned. Very nice. I also don’t have the patience (or, frankly, the desire) to pursue this kind of art. I guess I’ll stick with mazes. Dan and Mom – Thanks for your comments. It would take a lot of patience if I were to have done it all in one sitting. But I painted over the course of about 7 weeks, 2 hours at a time. And I sure looked forward to those 2 hours! Great painting, David! Before I “critique”, let me just say that I could not reproduce what you’ve done…you’re a professional! Regarding the stonework, is there a technique to bring out more of the 3rd dimension of depth? 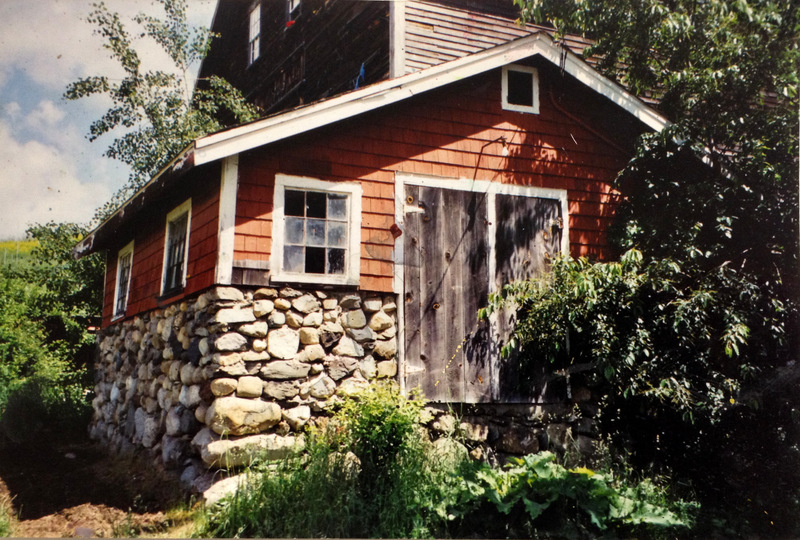 The stone wall on the barn looks a little 2-dimensional, especially as the wall forms the corner of the barn. You are very observant, mein Bruder. yes, I think there is a technique to increase the three-dimensionality (is that a word?). I could have lifted more paint out of the bright spots on each rock and made the shadow areas a little darker. Regarding the corner, I think I could have made the line created by the corner more crooked, showing more of the rock dimension. This is definitely where “seat time” comes in! Thanks for checking out the post! Beautiful painting! I have known Joan for many years and took class from her for 7. I love the girls in that morning class and miss them all!! I took a break from watercolor to try oils and pastels but I need to get back to watercolor! You are in good hands with Joan! Ann – Yes, it is a great group in the morning class! I’m hoping to get back to another round of classes on Thursday morning. If you feel like commenting, I’m wondering how you feel about the differences between watercolor and oils and pastels. I’ve never tried oils or pastels, but I know you have a lot more control with them than with watercolor. I got that from the maze reference. 🙂 Thanks for checking out the post, Dan. Brilliant post. I like the whole process. Thank you for sharing – N.
Thank you for visiting my blog, Nin! Love your travel blog (http://ninstravelog.wordpress.com/). Dave, this is amazing! Congratulations! First of all, there is almost exactly the same old barn in Stamford, I will try to google it. But more important I really enjoyed seeing the steps you made and I read every single line. Joan sounds like a great teacher. Btw, I was appalled to read that any teacher even dared taking your brush without asking! I never had a course on watercolors and almost ruined my Tübingen painting because I left on the masking and went to the gym:-((( Years later I actually retouched it with a very thin layer of acrylic. I must say your foliage came out wonderful, this was always tough for me with watercolors, I just learned some new techniques! I actually liked it already in Step 8, I find rough foliage very nice, this was always an arguement with Markus. Him trying to tell me how to paint. Good grief. Anyway, the finished product is also beautiful. And stones, oh stones, they have caused me such misery. And yes, this kind of work takes hours and hours and weeks and months. That’s why my stuff is expensive, and most of it is still hanging on my walls 🙂 But my paintings are my babies. And it’s amazing what you see when you stare at something for a long time. Reflections can be so complex. And most importantly, the best thing is the joy of painting! Of course we want the finished product to be perfect, but the process is so soothing and satisfying! And this is coming from someone who unfortunately hasn’t been able to paint for years. But before I go on here, I’ll send you a e-mail, you should definitely try out water-based oil colors! 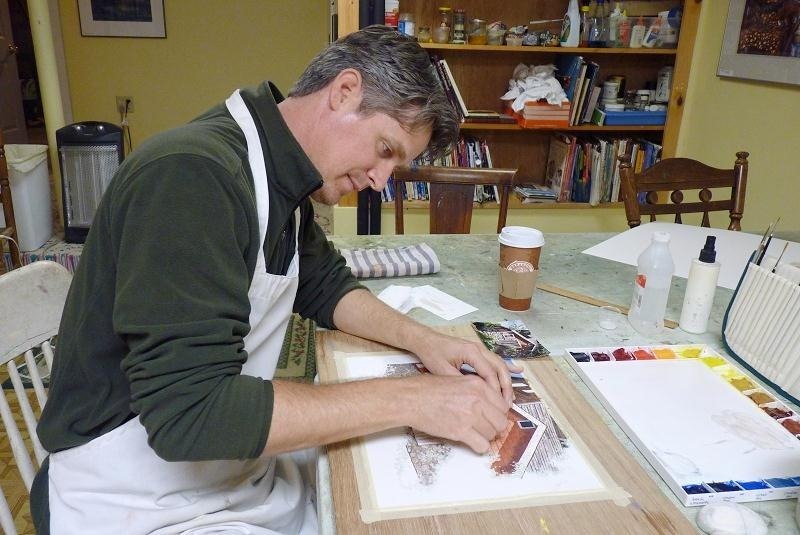 I will also send you info on a friend’s husband who paints with pastels! lots of hugs! The foliage and the stones were the biggest lessons for me here. And I SO agree with what you said about really looking at something for a long time. It’s very spiritual. I’m not actually sure that I’d be able to sell one of my originals — it would be hard to let it go! Each painting captures a special moment (or set of moments) that would be hard to let go.